The French for outclass is the regular ER verb surclasser. 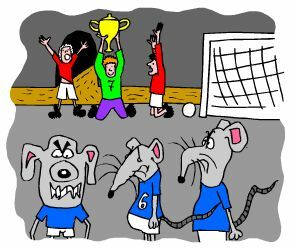 To remember this imagine that your son's football team OUTCLASSES the SEWER CLASS team of SEWER rats. ... your ability to recall new French words. outclass! surclasse ! surclassons ! surclassez ! ⇒Surclasser is a regular ER verb conjugated in exactly the same way as thousands of other regular ER verbs. ⇒Learn surclasser and it will reinforce the pattern for ALL those other ER verbs. ⇒ They feature French verbs like the French verb surclasser - French for outclass. ⇒ You can more easily remember words like the French for outclass - surclasser using the techniques of the world's Memory Masters. 200 Words a Day! Free Daily French Lesson Online - the verb in French for outclass is surclasser - fully conjugated.